When you purchase a new outdoor barbecue for your patio, you should always thoroughly read the owner’s manual. Most brand new grills will require some assembly. So you’ll need to follow the installation instructions included in the owner’s manual. Here are some potential issues with your grill's fire and some basic safety precautions for cooking on an outdoor gas grill. While this article pertains to PGS grills, many of it’s principles can be applied to most gas grills. Before attempting to light your grill, inspect the hose or gas supply. If it is evident there is excessive abrasion or wear, or the hose is cut, it must be replaced prior to the grill being operated. Please contact your local dealer/distributor for the correct replacement gas hose. Always open the lid completely before lighting the burner. This is to avoid trapping gas fumes, which could ignite. Do not stand with your head over the grill when lighting the burner. Open the lid. Examine the interior to be sure it appears normal. Turn control knobs to OFF position. Either control knob may be used when lighting your PGS gas grill. Turn gas ON at tank or supply. Turn either knob to Medium and gently push the red button on control panel ignitor module. You should hear the ignitor clicking and one half of the burner should be lit within four seconds. Turn the other control knob on “HI” and the other burner will cross light automatically. Visually verify that the burner lights and the flame is acceptable. Close the grill top and let the ceramic rocks get hot. Pre-heat the grill on HI with the lid down for five to seven minutes. This will ensure even heat. We strongly suggest observing grill for two minutes before leaving. Small leaks and or spider fires can easily be remedied if caught immediately. Here is a quick reference guide for problems that could occur with your grill, and some common causes for each problem. Warped or bubbled Lower Casting Burner burnt out and emitting too much flame in one area melting casting. Immediately turn controls OFF to prevent gas buildup. Wait five minutes for gas to clear and try the above procedure again. If the burner does not light with the electronic ignition, light the burner with a match or other handheld ignitor. Under some adverse wind conditions it may be necessary to turn the grill or to light the burner via a vent opening under the grill head. DO NOT TOSS A LIT MATCH INTO THE UNIT AND TURN THE GAS ON! If the grill still fails to light, check the gas supply. You could be out of lp gas or the main gas supply for natural gas may have been turned off. If the lp tank has gas or the natural gas is turned on and the grill still will not light: check the electronic ignitor to make sure it is sparking. if not, check the battery in the module and also make sure the ignitor wire is connected both to the module and to the bottom of the electrode. In many areas of the United States, spiders or small insects have been found to create "flashback" problems. 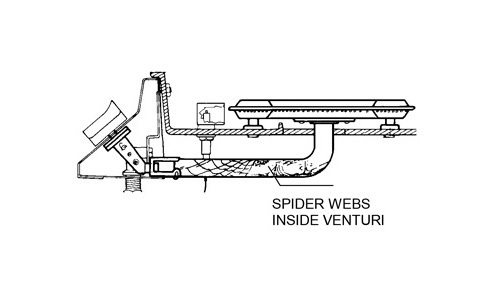 The spiders spin webs and/or insects build nests in the grill's venturi(gas) tubes. The web and/or nests can lead to gas flow obstruction, which can damage your grill as it results in a fire in the venturi tubes(aka a flashback). The grill may still light, but the obstruction does not allow full gas flow to the burner. Therefore, some gas will back up and escape at the venturi air shutter. This will ignite, causing flashback, which could also damage your grill. Your PGS grill has fine mesh brass screening placed around the burner venturis to minimize this problem. Please DO NOT damage or remove these screens when you clean your burners. If you live in an area where spiders are plentiful, you should make it a point to clean the venturis often. You may want to spray around the bottom of your base with non-flammable insect repellent on a regular basis. 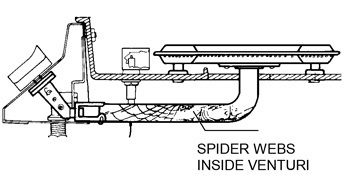 To clean burners of spiderwebs correctly can require some amount of disassembly to access the venturi tubes (refer to the owner’s manual for complete instructions). When you cook fatty foods over an open flame, you can expect flare-ups. Natural juices falling on the hot ceramic rock results in flame and smoke that give foods cooked on your grill that delicious outdoor flavor and appearance. Expect and encourage a MODERATE amount of flare-up. We suggest that you trim off excess fat before cooking. Excessive flare-ups occur when cooking extra fatty foods, or if cooking temperatures are too high. Turn your control knob to a lower heat setting. Move the meat to another part of the grill, if possible. With a dual burner, you can cook on one side and move food, as necessary to the unlighted side or lower heat setting. Cook with the lid open to reduce heat inside of grill head. Periodically flip rocks so that it will self clean residual grease build-up. If you need to immediately control any excessive flare-up, spray the flame with water or throw a small amount of baking soda directly on briquettes (avoid baking soda on food). Before using your grill for the first time, please light and turn both burners on HI heat for ten to fifteen minutes. This will burn off any oils that are on new surfaces. Before grilling, we suggest putting a light coat of vegetable oil on your cooking grids. This should be done before you turn on your grill. A spray of oil, like safflower or similar oil will work just fine. Burning unit after each use is not required or recommended. Extended burning may cause premature wear on components or may damage your unit if left unattended. Pre-heating grill 5-7 minutes before each use will burn off most residue. After the cooking grid has cooled, we recommend that you lightly rub the cooking grid with a nylon cleaning pad or similar material to remove any baked on foods. Please remember to lightly oil the cooking grid with a spray on oil, vegetable or safflower oil before using the next time. If your grids have a lot of food on them, you may want to put them in a plastic bag with a cup of ammonia and leave them in the sun for a day... be sure to wash them thoroughly before using. You may clean your stainless steel cooking grids with a brass wire brush. Do not place cooking grids, rock grates or rock in a self-cleaning oven. Always keep your grill covered when not in use. AEI Corporation has been a leader in manufacturing gas grills and outdoor heaters since 1966! AEI has a reputation, across North America, for making high quality appliances for homes and businesses alike.